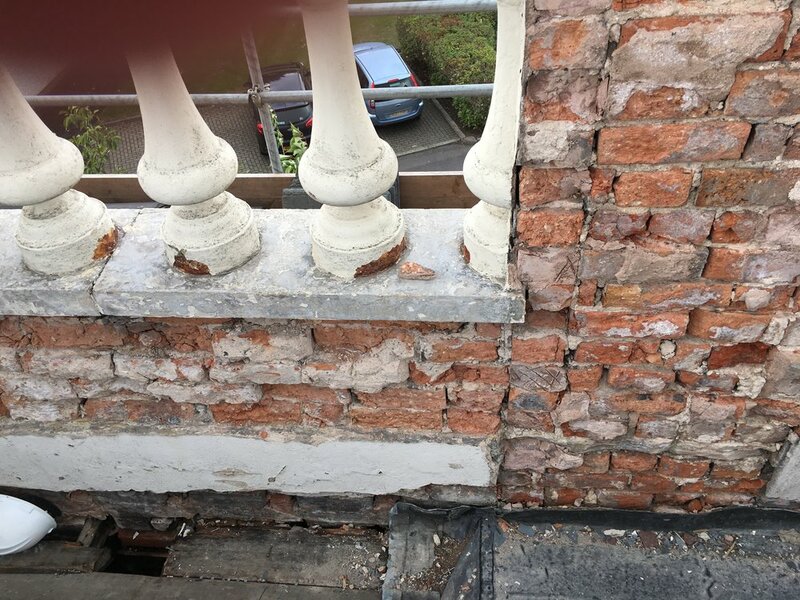 Below are a series of images showing the state of the roof and the parapet wall prior to refurbishment. This image shows an area of sound brickwork that did not require any work prior to having new render applied. The surface is sound and only minor damage has occurred to the face of the brickwork. This image is of the external face of the west elevation parapet wall, just below the chimney stack. 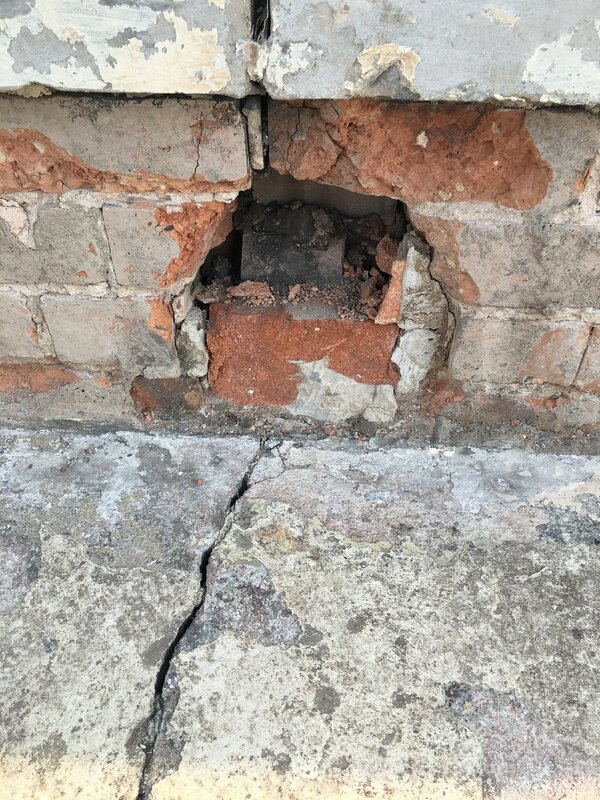 This image shows an area of defective brickwork. Motor between the brickwork is heavily eroded requiring the installation of metal bars to provide sufficient structural strength. The surface of the brickwork is heavily damaged and required a bonding agent to be applied to make the surface ready for rendering. This image is of the internal face of the south elevation of the parapet wall. This area shows an area of missing bricks that came loose during in the removal of render. The remaining brickwork is largely sound. This area is of the internal parapet wall on the west elevation of the parapet wall, just below the chimney stack. The satellite dish has been removed. This area is s of the internal face of the south elevation of the parapet wall and shows further the damage to the brickwork. This pillar was found to be unstable once the render was removed. This pillar had to be taken down and fully rebuilt. This pillar is on the east elevation of the parapet wall. Many areas of the parapet wall had loose and flaky brickwork. This had to be removed before any render could be applied to ensure that the render did not fail in the future. The stone cornice that surrounds the base of the parapet wall is supported by copper straps that have failed. The failed straps have cause the cornice to crack, which has allowed water ingress and led to further decay. It was not known that these straps existed prior to the removal of the render. This area shows an area of the cornice at the base of the parapet wall. The area is heavily eroded due to water ingress and required removal and refitting with copper straps with some re-moulding. This image shows the roof rafters and the box gutter supports. Almost all of the box gutter supports were rotten and required replacement. Around 25% of the roof rafters were rotten and required replacement. this image shows the rafters in a sound state and only the gutter supports were replaced. 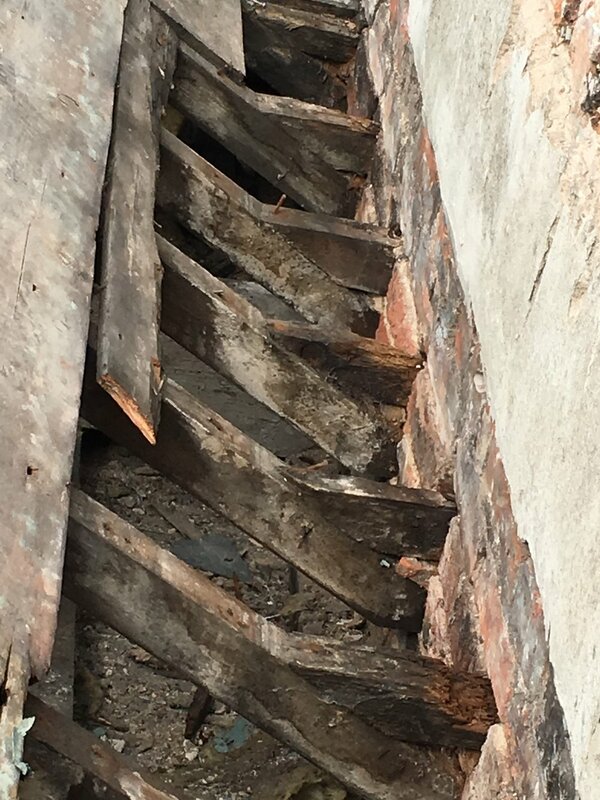 This image shows rafters that were so rotten they had completely deteriorated. In this section all rafters and gutter supports were replaced.